This laboratory tableaux is built in a 4 ft. X 8 ft. corner alcove. Most of it is an assemblage of hand-made ceramic units. One wall is covered with switches, blinking gauges and electrical instruments. On the other wall, a monstrous embryo-like creature is poised at the control panel in the incubator-control room. 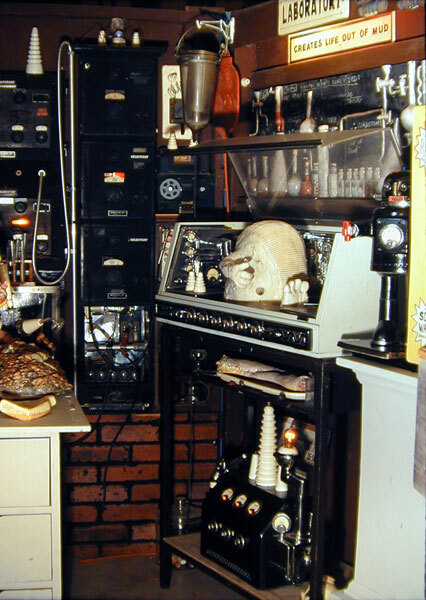 This is a bioceramic-laboratory in action, and Dr.Gladstone's nearly plausible theories are written on the blackboard to explain the Dr. Gladstone method of creating life out of mud. We are invited to ponder the true meaning of Kaolithic Activity when mud is turned into stone. 4 ft. X 8 ft. X 8 ft.